The past two months for me have been quite an amazing whirlwind, and only now do I have the time to write down all of what has happened. I’ve always been a collector; when I was young it was baseball cards and comic books, starting in college I gravitated to Jazz music, and in the past decade I’ve added Jazz Dance-related films and artwork to the mix. This story starts about six years ago when, in my thirst for finding new-to-me dance clips, I stumbled upon an out-of-print VHS tape called Chicago And All That Jazz. 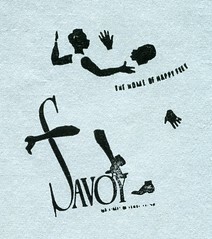 It was originally one of two television specials sponsored by DuPont in the early 1960s that featured Al Minns and Leon James, the great Savoy Ballroom dancers and members of Whitey’s Lindy Hoppers. Not long after getting the VHS I decided to digitize it and upload the video to Youtube. It’s been nearly six years since then as of this writing, and out of everything I’ve ever uploaded it has gotten the most views and the most comments by far. It’s a great clip and I’ll let it speak for itself. Over the years there would occasionally be interesting comments on the video, and sometimes I would respond. Out of the blue, however, came the comment this past August that briefly stated, “God, how my father loved to dance!” The username: Kevin Minns. Upon seeing this I immediately started writing an email (sort of gushing, I admit) about how big of a fan I was of his father and how I’d love to talk to him. Before sending the message, my fanatical collector’s brain served me well: I remembered a magazine I had discovered a couple of years ago, which featured Al and Leon, with Al’s kids and Leon’s kids dancing alongside them. I pulled the magazine out and to my delight, there was Kevin, only four years old, right on the cover. I mentioned this in the message, thinking he must know and have a copy of the magazine himself. Kevin’s first message to me began, “This is the best news i’ve ever heard.” He then proceeded to tell me how had never seen photos of himself when he was young– he never even knew what he looked like as a child until that day. I soon came to understand that the discovery of the magazine photos were instrumental in easing some pains that he has held during his life. How valuable it must be to see yourself so happy after an entire life of not knowing or remembering those years! After a number of emails back and forth, I set up an online video chat with Kevin. What I thought might be twenty minutes turned into an hour and a half of talking, laughing, and reminiscing. I was especially excited to share some of his stories with everyone, since I arranged, with his permission, to record the conversation. The technology gremlins struck that evening however as I discovered the recording didn’t work. Before I go on I should say during all of this, my teammates at Groove Juice Swing and I were in the thick of organizing the 15th Annual Steven and Virginie in Rochester workshop weekend, held this year in early October. Steven Mitchell and Virginie Jensen have been an instrumental part of our dance lives, and I had talked with Steven a year ago about having the theme of the 15th year be “Tribute”, to the music we love, to the history of the dance, and to the people that have formed Lindy Hop into what it is today. We had some ideas but not a lot had gelled until I met Kevin. From the moment Kevin arrived he was a wonderful presence at the event. He had never been to a Lindy Hop event before, and he was wowed by the joy that this dance brings to people. He was especially excited to learn how to Lindy Hop, to quite literally follow in the footsteps of his father. Kevin danced early in life but admitted to me he hadn’t danced since youth. A special moment I will never forget is witnessing him in class, swinging out for the first time. He also stayed up with all of us at both late night parties, talking for hours to everyone interested in his story and sharing recollections of Al and Leon. Having Kevin in for this particular event was especially appropriate since Al was the first old timer that Steven Mitchell contacted and learned from, even before he and Erin Stevens found Frankie Manning. We brought Manu Smith in to facilitate the tribute, which consisted of a historical photo and film presentation I prepared, followed by Manu, Steven, and Kevin talking about Al’s life and dance history. The talk turned out to be even better than I had hoped. In my opinion, the stories Kevin told helped humanize Al Minns. He was no longer just a legend we had all seen in Hellzapoppin’ and other films; he was now, to us, the man and the legend. I think a truly amazing thing about the event was that, for the amount it touched all of us to hear these stories from him, it was at least as touching to see how much this meant to him. Here was a person that, for most of his life, had just known of his father as “Pops”– not as some famous legend. Dancing was his dad’s profession, and it was taken as such. Now, 27 years after Al’s passing, Kevin is finally seeing how much of an effect his father has had on people, and how much joy this dance brings to those who dance it. We videotaped most of the talk (and will release the best parts of it before too long, don’t worry!) but there were so many great moments over the weekend that aren’t captured anywhere. He even gave a heartfelt farewell during the Sunday musicality class. His goal is to come back next year and be good enough to really get out there and share in the dance that his dad loved so much. He told us that this weekend and this whole experience has changed his life, and that he truly feels part of “The Lindy Hop Nation”. He bonded very tightly with all of us and we all can’t wait to see him again. This experience has inspired me to do more research and filming with the intent of one day making a documentary on the lives of Al and Leon. It’s a daunting task and I am sure it will take many years to complete, but I feel there is a great story here to tell. I recently was brought in to Philadelphia to teach a DJ workshop. One of the topics that I brought up was my stance on music piracy. This is a touchy subject, especially among the young-ish Lindy Hop crowd who have grown up swapping files online. Beyond the fact that purchasing your music is simply the right thing to do, my take on it is that the Jazz music we love is unlike the pop music churned out by the record industry. Oftentimes it is put out by independent labels who care about the music itself even more than we do. So you copying that album from your buddy (or, as the case might be, a whole collection from a buddy) directly affects the people striving to provide us with this great material. You choosing to purchase it supports these companies and allows them to continue releasing more of the music you love. There is also the issue of new bands or artists that are still alive. Always buy, and buy directly from the artist if you can! This is their livelihood and they are not making heaps of money off of this. I personally know many currently active swing musicians, and I definitely want them to be able to continue releasing recordings. They deserve more than fans pirating their music. As a side note, there may be many ways people justify piracy, but it’s still illegal. In the U.S., if the song was released in 1922 or earlier, it is now in the public domain. Unfortunately for us, most of the music we listen to was published after that. The bad news is that new songs will not begin to enter the public domain until 2019. Another point is that I’m a big fan of liner notes. The more you know about your music, the better a DJ you will be. When you download tracks from the internet or from friends, you get very little information (and sometimes completely incorrect information!) about the music itself. Learning about the music you play will lead you to discover more music in the same vein. Trust me, if you are serious about your music, this will be to your benefit. I’m going to get off my soapbox for now and give you what I gave the aspiring DJs in Philadelphia: a list, simply as an example, that shows how you can get a great collection of classic jazz for less than $100. This isn’t meant to be a definitive list by any means, it was just what I came up with spending twenty minutes online. I tried to include many sources to show it doesn’t all have to come from one place. I’m not including links because the prices and availability are sure to change after this writing, but you’ll get the idea. Benny Goodman – Did You Mean It? TOTAL: $94.15 (plus shipping) for 343 songs! A big thanks to the good folks at LaB who brought me in for the workshop, it helped me write down a lot of the stuff that has been in my head for a while. Sheet Music; "My Biggest Hit," says Goodman. One of my favorite tunes to dance to has always been Don’t Be That Way. It’s often associated with Benny Goodman, since he is the one that brought it to the masses. The original, however, was composed by Edgar Sampson and first recorded by Chick Webb in 1934. I think (at least for me) part of the confusion on this tune came from an apocryphal scene in The Benny Goodman Story, a mediocre film from 1956 starring Steve Allen in the title role. At one point late in the movie, someone tells him they need to announce the title of the song they’re about to play. He replies (and I’m paraphrasing here) “Everyone’s always telling me, ‘Benny, don’t be that way,’ so that’s what I’m going to call this new tune.” I haven’t seen the film in years, but I remember thinking the delivery was robotic and I disbelieved the story immediately. What I didn’t realize was that it wasn’t even his tune. 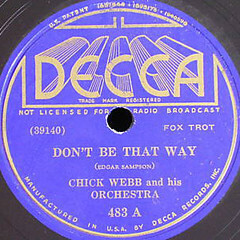 The real story is that Edgar Sampson composed Don’t Be That Way for Rex Stewart’s band in 1933.¹ Unfortunately they did not record the tune, and that same year Sampson left Stewart to join Chick Webb’s band. This was a very prolific time for him; it was the same time period he composed such classics as Stompin’ at the Savoy, Let’s Get Together, and Blue Lou. Only later would Benny Goodman make Sampson’s creations worldwide hits. Here are some of my favorite recordings of Don’t Be That Way that showcase its versatility, through a number of styles and tempos. The original recording has that characteristic Chick Webb stamp to it: snappy tempo, tight horns, and that rhythm that just makes you want to jump. I love the rhythm guitar by John Trueheart on the first B section, it almost makes you forget the trombones are even playing. Some signature Webb comes at the end with saxophone trills and a short drum solo. In all a solid recording, but fame would elude this tune for a few years. There were no studio recordings of the tune between the original and this one more than three years later by Lionel Hampton. Only three live recordings captured it in these interim years, so it is apparent the tune was not in high demand. All that was about to change, however. 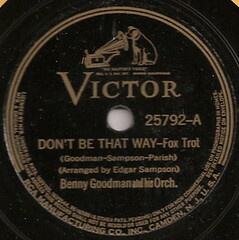 Just two days before this recording, Benny Goodman played Carnegie Hall and opened with Don’t Be That Way. Hamp may have recognized that the tune would be instantly popular and rushed to record it before Goodman had the chance to, or perhaps it was just coincidence. At any rate, we have an exceptional gathering of musicians here: the composer himself taking the first B section on baritone saxophone, then the incomparable Johnny Hodges and Cootie Williams taking solos on the next chorus, respectively smooth and growling. Hamp changes just a couple notes here and there to let the melody take on a completely different feeling than Webb (or Goodman, for that matter) ever had. 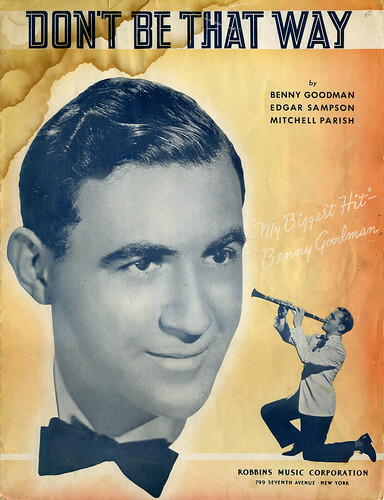 The next month, Benny Goodman made it into the studio to record the tune along with One O’Clock Jump, which was also featured in the Carnegie Hall concert. The arrangement, by Count Basie, would become the standard that his big band would follow for years. The record was a huge hit for Goodman, and stayed at #1 on the Billboard charts for 5 weeks starting that April. I’ve chosen not to include the live Carnegie Hall performance, and not even the record pictured at the right. What you hear is Take 2 from the same session; I find it much more interesting than the recording that took the country by storm, and I like to think it is the way the musicians really wanted to play. To start, the trumpets are a little punchier and staccato. The big difference, though, comes in the solos from Goodman and James. Instead of trying to spell out the melody again for the listener, they let loose as if they were in a jam session. If you have this one at home, try listening to them back to back. Our next recording comes just one month after Goodman’s, and from none other than his piano player, Teddy Wilson. While Wilson didn’t play at Carnegie Hall, he knew a hit when he heard it. Again I am not including the commercially released take, but an alternate that is in my opinion superior. Wilson’s take on the melody’s rhythm and phrasing gives it an even livelier mood than before, especially with his playfully interwoven responses to the band on piano. Whenever I play this recording for friends for the first time, they tend to listen for a few seconds not knowing exactly what to expect, then say, “…Yeahhhhh!” out loud. We now fast forward two decades, where our tune has now achieved ‘standard’ status. It was one of the great anthems of the Swing Era, and now in 1957 it is a familiar and beloved melody. The songs in these sessions with Fitzgerald and Armstrong represent some of the best of classic American music, and Don’t Be That Way is right at home in the set list. This is our only example with the lyrics included, and the first noticeable difference is its drastically different tempo. They take on such a relaxed attitude that it is almost a different song from what we have heard before. Ella and Louis are both masters of singing ahead of and behind the beat, hitting each word early or late as they see fit. They do both here, and it is those late notes that make it feel even lazier and more dreamlike. This seems like worlds away from the first recording, and it must have been a great experience for Ella to put such a different spin on it since her days in Webb’s band. Our last example, and the only live recording of the bunch, comes one decade later from the man who made the song famous, Benny Goodman. He keeps some pieces of the original arrangement, such as the staccato trumpet during the main theme, as a bit of an homage to the good old days. The player who really excels here though is Zoot Sims, whose driving tenor solo propels the song from the quaint intro to its rollicking finale. These are just a few examples of the literally hundreds of times that Don’t Be That Way has been recorded. Write a comment below if I’ve missed your favorite! ¹ The Blackwell Guide to Recorded Jazz, pg. 101. ² American Popular Song: The Great Innovators, 1900-1950, pg. 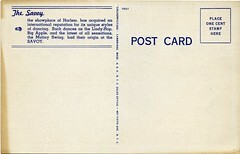 496. Readers have probably noticed that things look a little different around here. I’ve been getting my hands dirty in CSS in an attempt to make the site look like one of my posters. While it’s been a couple of weeks since it started to look different, I only just now made the final tweaks. Since my post about E. Simms Campbell’s A Nightclub Map of Harlem, I’ve talked to many people about where the original might be, as well as other jazz maps that have been created over the years. The first one that popped into my head was a vague recollection of a jazz map of the United States, with cartoony drawings of all the old greats. For days I couldn’t remember where I had seen it, until I realized it was in a book that I own. 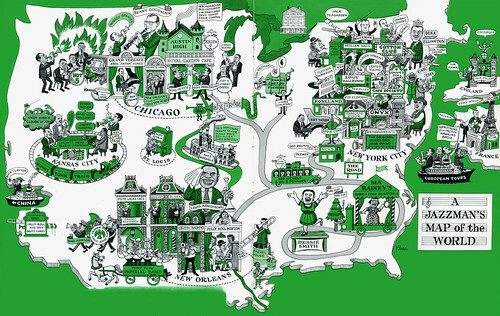 Drawn by Jim Flora, who is famous for his jazz album covers in the 40′s and 50′s, I found A Jazzman’s Map of the World in the accompanying book of one of Time-Life’s The Swing Era LP sets. These sets are actually pretty great for their books, if not for the music itself. This one comes from the 1938-1939 volume, titled “Where Swing Came From.” This drawing does a good job of showing just that: most of the bases are covered by Flora on jazz’s early influences. He did a pretty good job of reproportioning everything on his map of the world; it reminds me of the old drawing of a sensory homunculus, which represents a human with body parts resized according to how much space in the brain is concerned with its sensory perception. In our view of the world, we only perceive jazz, right? Harlem Renaissance, by Tony Millionaire. Posted with permission from Ephemera Press. The next two maps I came across are modern jazz maps, courtesy of Marc Miller at Ephemera Press. Marc was the curator of the Smithsonian’s Louis Armstrong: A Cultural Legacy exhibition that contained A Nightclub Map of Harlem in 1996, and was so inspired by it he had illustrator Tony Millionaire create two amazing maps centering on Manhattan and Queens, NY. 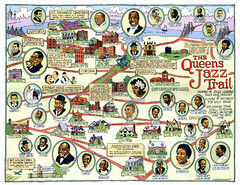 The Queens Jazz Trail by Tony Millionaire. Posted with permission from Ephemera Press. 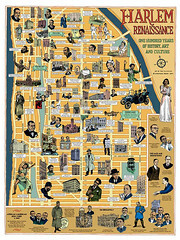 In Harlem Renaissance: One Hundred Years of History, Art, and Culture, Manhattan is represented in a map of Harlem with sidebars representing Broadway and downtown. This work is packed full of information, and while not as fanciful as Campbell’s drawing, it would definitely be more suitable for a walking tour of Harlem. In The Queens Jazz Trail, we see the homes of dozens of legendary jazz musicians with their exact addresses. It is similarly full of great information about the different neighborhoods in which they lived and looks appropriate for a driving tour of Queens. Both of these maps are posted with permission from Ephemera Press and can be ordered directly from their website. The intro is one of my most favorite ever. Simple and cute at first, then gives you something to chew on right before that gorgeous bass kicks in. Just listening to every perfect response OP has for each of Anita’s lines in the A sections gives me chills. This is one of those songs that I just can’t help but get mushy over. Sometimes I forget Peterson is playing on this one because Bill Henderson drives the song so directly for the whole performance. It’s really Peterson and his trio though who take the song, start it out, kick it into gear, kick it up even further, and bring it way way down at the end. I love how he is brimming with energy at the beginning of that second kick, but he starts calming the band down soon after for the ending. Classic. I could write a whole post about how I think the Ella and Louis albums are the best examples of classic American music and how every American should own all three of them. Here we have one out of many classics, and who else could better compliment the royalty of jazz than the Oscar Peterson Quartet? It’s another perfect example of how Peterson knows how to stay understated and how to support the singers. I love how Ray Brown moves things into high gear during Satch’s trumpet solo. Keeping it mellow again with Armstrong, Peterson and his quartet back him up as only they could. I love the interplay between Herb Ellis and Peterson on this one. Nothing too fancy on the guitar, but the way they dance around each other is perfect for this tune. I had to end this post on a high note. Here Oscar backs up one of his own on vocals: yup, that’s Ray Brown singing, with the rest of the band egging him on. There’s actually way more instrument than voice here, but this fun rollicking session has the same great back-and-forth between the piano and singer that we’ve heard here before. I’ve focused only on studio recordings here but there are also some examples of Peterson with vocalists in live settings. Comment if you have a favorite or if I’ve left out something essential. Probably the first thing that might shoot to mind is his album where he accompanies himself, but I purposely left out With Respect to Nat because there isn’t a relationship between two musicians there (and incidentally the vocals were recorded separately from the piano). It’d be a stretch to commend someone for not upstaging themself. I read that Life Magazine has put about 20% of their photos online via Google (with plans for 100% in the next few months), and I immediately thought of the great Lindy Hop photos from the 40′s featuring Leon James, Willamae Ricker, Stanley Catron, and Kaye Popp. The simplest search revealed all the photos available from the session, which includes many not featured in the original magazine. I then recalled the earlier feature on Frankie Manning, where if memory serves me, a reporter went to a bar where he happened to be dancing and snapped this photo. 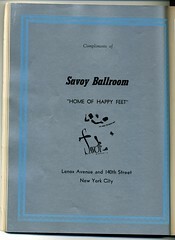 Savoy Ballroom, which features a cool costume contest. Comment with any other interesting searches you can find! 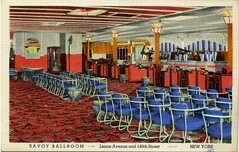 Images of the inside of the Savoy that aren’t of the dance floor are harder to come by. I do find it kind of odd that the focus of the painting is the ugly chairs and that the view of the dance floor is blocked. You can make out the side-by-side bandstands in the back though. Here is a cool advertisement I found in a fancy dance program. It was titled “Harriman Democratic Club Spring Festival and Dance” and was held at the Audubon Ballroom, Sunday Evening May 19th, 1957. The program is full of pictures of the members of the club, advertisements from local Manhattan businesses, and little else. I’m kind of surprised at how well put together (and hefty!) the program is. 120 pages, printing in blue, black, and silver ink. I think I may remove the Savoy page and frame it. Here’s the detail of the ad. Love the design. Looks like it was a larger ad that they scaled down for this. I think it’s supposed to say something below the dancers but the print size makes it impossible to make out. At least we can make out “The Home of Happy Feet”! Many thanks to Colin for inexplicably giving up his ticket to see Al Green on the last night of the Rochester International Jazz Festival. Corinne and I went to see an amazing show, and I swear the man doesn’t sound a day older than he did in the 70′s. Hearing him sing the hits we know and love was amazing, but even moreso was the section of the set where he paid tribute to the music that inspired him. When he started singing “My Girl,” “I Can’t Help Myself,” “Sitting On The Dock Of The Bay,” and especially “Bring It On Home To Me,” I got goosebumps. Here are two of my favorite Al Green songs that are less than famous but beyond wonderful. When I first heard this song I played it non-stop on repeat for three days. I can’t get enough of it. Apparently this was not a big hit when it came out, but I daresay I like it better than the original. A few years later we hear Al after he discovered his distinctive less-is-more style of singing. It’s no surprise that this was recorded in the same session as Let’s Stay Together. In my pie-in-the-sky daydreaming I thought how awesome would it be for Al Green to play at Swing And Soul, but a quick approximation of how much money he made the night I saw him definitely puts that idea in the realm of next-to-impossible. I highly recommend catching a show of his if you get the chance.